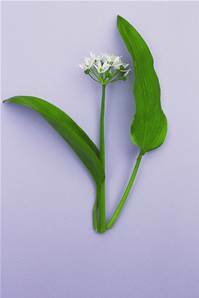 Ramsons grow in deciduous woodlands with moist soils, where they are most commonly found in slightly acid soils. They flower before deciduous trees leaf out in the spring; during flowering the plants fill the air with their characteristic garlic-like scent. The stem is triangular in shape and the leaves are similar to those of the Lily of the Valley.